In the early days of the United States, one of the most prominent booksellers in the state of Connecticut had to be Hudson & Goodwin of Hartford. I assume this because of their ability to run a full-page ad on the front page of the Connecticut Courant announcing new books recently added to their stock. 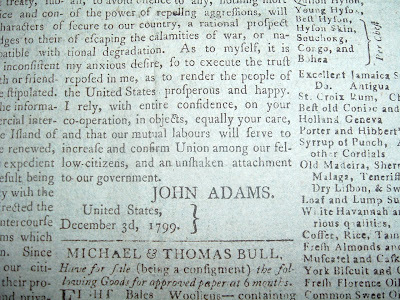 It helped that they also owned and published the Connecticut Courant. Hudson & Goodwin, Have for sale at their Store opposite the North Meeting-House, Hartford, the following BOOKS, which they have lately received from London, Dublin, and elsewhere--VIZ. 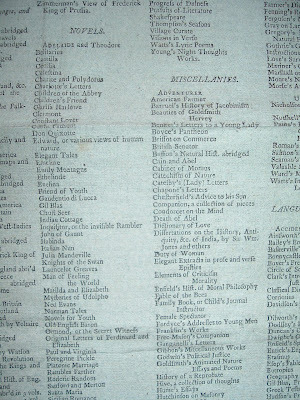 There must be several hundred books listed by the following subjects: Divinity and Ecclesiastical History; Law; Medicine; Biography, History, Voyages and Travels; Novels Poetry, Arts and Sciences; Languages and School Books; and Miscellanies. 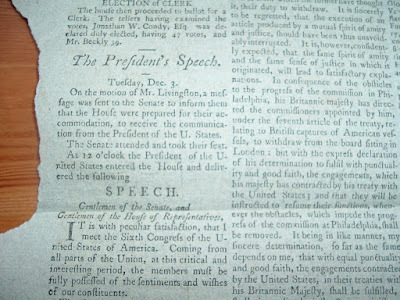 Taking a back seat, or second page, to the front page news about a bunch of new books is none other than President John Adams and a speech he gave to Congress. 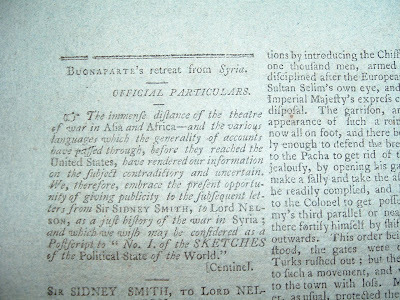 Also something about Napoleon retreating from Syria, according to letters from Sir Sidney Smith to Lord Nelson. 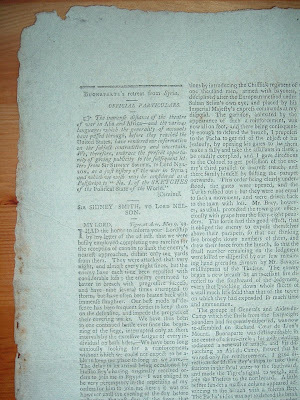 Napoleon's retreat was reported on page 4. But on this day, books took center stage, page 1. I'm sure that wasn't the first nor the last time that would happen either. When Hudson & Goodwin had a bunch of books fresh off the boat to sell, well, they owned the local newspaper so why not get the word out. Those other newsmakers would still be around the next day. 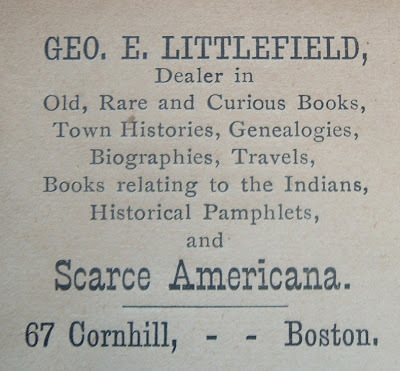 Here is an ad cover from 1894 advertising the business of rare book dealer George Emery Littlefield of Boston. 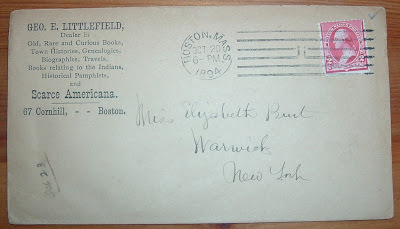 Littlefield lived from 1844 to 1915 and, in addition to selling rare books, he published many catalogues of rare Americana and genealogy. 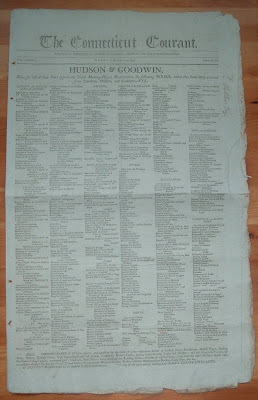 He also published in 1900 a volume of bookseller history, Early Booksellers of Boston 1642-1711. There is surprisingly little else on Littlefield that turns up on the Internet, especially considering that two book were written about him, neither of which I can find: An Old Boston Bookseller: George E. Littlefield as I Knew Him, by Frank Jones Wilder and George Emery Littlefield, A.B., by John Woodbury. My relations with the Boston booksellers were from the start, as they always have been, most cordial. 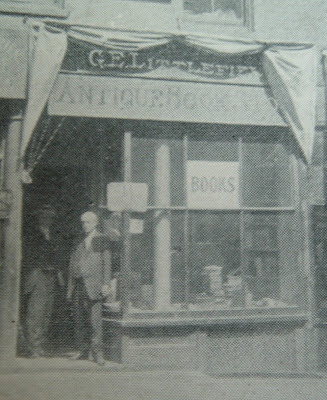 Prominent among them was George E. Littlefield, at the time dean of the Boston secondhand booktrade. Mr. Littlefield was a Harvard graduate and had a decide bent toward historical research. He specialized in Americana, particularly in genealogy. I found him a good friend, always most helpful... Cornhill, a short street descending the lower slope of Beacon Hill easterly from Scollay Square, was at the time of which I write, even as it is now, distinguished by the old book shops on either side. The aspect of Littlefield's establishment at No. 67 was rather unattractive. Its walls were lined by shelves built to the ceiling. These and a central stack contained a miscellaneous lot of books in which the proprietor appeared to take little interest. His desk, surrounded by rows of Americana and buttressed by dusty piles of pamphlets, was on a raised platform in the rear. Here he sat and wrote or entertained his cronies who, although not numerous, included mot of the Boston collectors of the time. He was brusque in manner and intolerant of casual visitors. 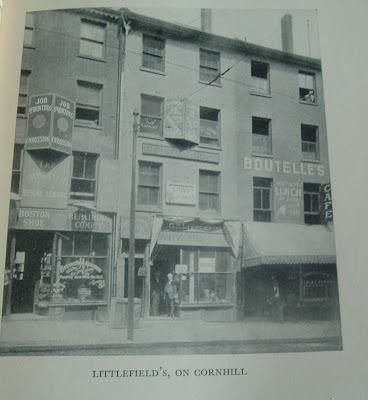 Littlefield's shop on Cornhill. Perhaps that is him standing in the doorway with a customer or employee. 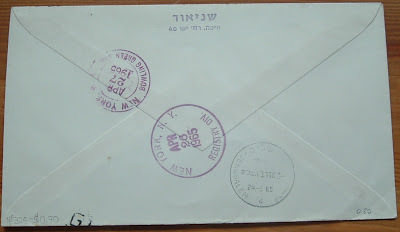 I recently acquired a box of bookseller catalogs from around the world and found one from Jerusalem that ties in with another piece of ephemera from Israel acquired in a separate lot. 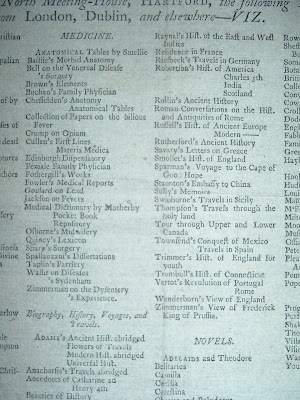 The bookseller's catalog is from Ludwig Mayer of Jerusalem. The catalog is titled Export List No. 16. Its size caught my eye first, the unusual dimensions of 8.5 by 13 inches. All titles advertised are for Hebrew language books unless indicated otherwise, but the listings in this catalog are described in English. The book shop that Mayer started in 1908 still exists and has been in the same location since 1935. 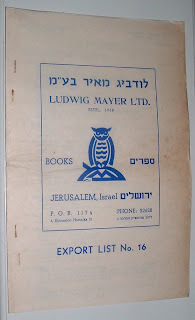 According to the shop's Web site, Mayer Books (Jerusalem) Ltd (its full name today) is the oldest book shop in Jerusalem. Their specialty is in academic publications with a special attention to the humanities. They stock books in Hebrew, English, German, and French. 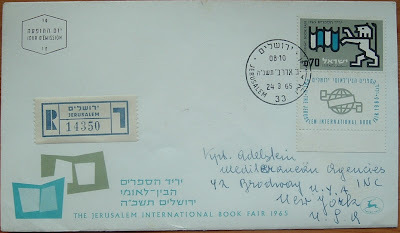 The second piece, from about the same period, is a 1965 postal cover advertising the Jerusalem International Book Fair. One of the largest in the world, the book fair started in 1963 and is held biennially. This 1965 cover advertises only the second occurrence of the book fair. As stated on their Web site (link above), the fair draws over 1200 publishers from more that 40 countries who display more than 100,000 books in different languages. A key event at each fair is the awarding of the coveted Jerusalem Prize, to a writer "whose work best expresses and promotes the idea of the freedom of the individual in society." Five writers who have received this award have also received the Nobel Prize for Literature. The 24th Jerusalem International Book Fair was held earlier this year and the 2009 recipient of the Jerusalem Prize is Haruki Murakami.